Ah, bad luck that's a shame. I wonder if anyone's made a list of what fish are compatible with CP, copper etc? For copper, yes. But not seen much for CP. Sorry to hear that Graeme , will running a little carbon help remove it from the water ? May save a little on the big water changes . 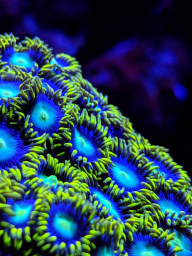 The torch just came out of quarantine, and was resting on its side and squished a few polyps - hoping they'll recover soon. Testing out LPS with my angel. 90% sure it was the angel that ate all my zoas now, as I also added a few zoas with the torch, and they've already been knocked down, and rolled about on the sand. I lost all my LPS quite a while ago to flatworms, but have been LPS free for a while, and have had my sixline wrasse in there to keep any pests at bay. Finger crossed! Frag tank is full. Mostly softies -a cabbage, a couple of rics, blue mushy with a bright orange rim, two different types of gsp, a huge leather with bright green polyps, and some blue/green Duncan (hoping my angel won't eat them. I've also got a load of tiny nass snails, some conch, a pair of cleaner shrimp, and a boxer shrimp. In quarantine to go in the display. I've been experimenting with what my angel will / won't eat. It's eaten all my zoas I'm not sure if it ate my gsp, but it may have done (it sulked a lot and slowly disappeared after having it for years). I lost all my LPS to flatworms ages ago, but when I reintroduced a hammer and a torch, they didn't last very long, so again, I think it was the angel nipping. The plan is to keep adding different softies, and aim for variation in textures, and colours. Really hard to find bright softies though.